dFakto is pleased to provide premier data consulting services to all of its clients and as such takes data privacy seriously, especially in our role as a trusted advisor and solution provider for data privacy products, solutions and services. The trust you place in our services when managing your private and personal information is honored by our company commitment to protect your information, both personal and corporate. Our data privacy compliance is aligned with and complementary to the methodological recommendations of the CNIL (National Commission Informatique et Libertés) in France, the Commission for the Protection of Privacy in Belgium, the National Data Protection Commission of Luxembourg and, of course, the European GDPR Regulation. We are committed to complying with all industry standards and continuously improving our data management and security standards and our role as trusted advisor to our clients. The proper treatment of data is our core business. With each of our clients or contacts we agree strict terms of non-disclosure, but more broadly we commit to full disclosure of how we handle the data that is shared with us outside of or formal agreements with more casual contacts and our general multi-media communications, such as through email and web communication exchanges. dFakto collects or received data for the purpose of customer communication management in regards to direct contact. We do not use your data for targeted profiling, and only retain data which assists in effective client communication, for the period which has been agreed. Our website uses these “cookies” to collection information and to improve our Service. You have the option to either accept or refuse these cookies, and know when a cookie is being sent to your computer. If you choose to refuse our cookies, you may not be able to use some portions of our online Service. For a better experience while using our Service, we may require you to provide us with certain personally identifiable information, including but not limited to your name, phone number, and postal address. The information that we collect will only be used to contact you directly or for communication purpose(s) you will have agreed to when providing us with the information. If you wish to modify, remove or request your information in line with your data subject rights, please initiate a request using the request initiation features contained at the end of this form. As required by EU regulations, after submitting a request it will be dealt with within the outlined time frames, starting from the date of the first working day upon which the request was received by dFakto. Where a request is not received, then the retention policy will apply. We want to inform you that whenever you visit our Service, we collect information that your browser sends to us that is called Log Data. This Log Data may include information such as your computer’s Internet Protocol (“IP”) address, browser version, pages of our Service that you visit, the time and date of your visit, the time spent on those pages, and other statistics. These are simply the data and statistics normally collected by all internet browsers and servers and not specific for identification. For a better experience while using our Service, we may require you to provide us with certain personally identifiable information, including but not limited to your name, phone number, and postal address. The information that we collect will be used to contact or collaborate with you. Personal information is requested here to identify the requestor and being able to provide him or her a personalized information. None of this information is shared and further treated for other purposes than information and marketing purposes and to join the newsletter distribution list. At the bottom of each communication received from dFakto you will be able to unsubscribe from the mailing. Once you have unsubscribed from any mailing from dFakto, your personal data will be removed within the following 12 months. Personal information is being collected here to identify and send directed newsletter towards the received. None of this information is shared and further treated for other purposes than to join the newsletter distribution list. 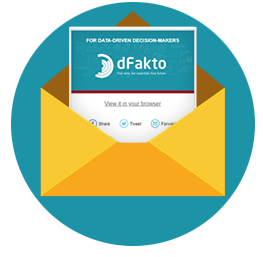 At the bottom of each single newsletter received from dFakto you will be able to unsubscribe from the mailing. Once you have unsubscribed from dFakto’s newsletter, your personal data will be removed within the following 12 months. Personal information is being collected here to identify the receiver and for statistical purposes towards. None of this information is shared and further treated for other purposes than the punctual tracking of downloads of dFakto’s supporting papers. The personal information collected are not integrated in any marketing processes and are only logged for statistical and historical trackers. Personal information is requested here to identify the requestor and being able to provide him or her a personalized information. None of this information is shared and further treated for other purposes than information and marketing purposes and to join the newsletter distribution list. The information office will respond to any question within the 3 working days after receiving your request. All the personal information processed by dFakto, and our client services are hosted and maintained on servers located within the European Union, unless explicitly contracted by our clients. No 3rd parties have access to any personal data provided to dFakto unless the law allows them to do so. All information is treated with the respect and concern for privacy one expects of a company dedicated to professional data governance and management. We do not disclose any information about our customers or former customers to anyone, except as permitted by law. We do not use collected or provided data for purposes beyond initiation and continuation of commercial contact, and will not use collected data for targeted profiling. All information collected and stored will be used and processed through our service as long as you do not unsubscribe formally from our services, or as otherwise specified and agreed at the time of providing your information. Information used for marketing purposes will be kept and solicited until you notify us formally that you no longer wishes to receive this information, or the retention period expires, which ever is sooner. More information on how to manage the the retention of your data is detailed below. Access to customer information is strictly limited to our internal staff or contractually constrained collaborators with a legitimate business reason for access. Physical, electronic and procedural safeguards are build and maintained to protect personal information from being accessed by unauthorized persons, and sensible access controls have been implemented for those with privileged access. This security rule is particularly applied and followed when processing sensitive data. Access to customer information is strictly limited to collaborators with a legitimate business reason for access. Physical, electronic and procedural safeguards are built and maintained to protect personal information from being accessed by unauthorized persons. This security rule is particularly applied and followed when processing sensitive data. Where we do use third parties they are obligated not to disclose or use the information for any other purpose. We will not share or sell your data to any third party, outside of processing directly related to our Services to you, in the capacity of an individual or our client. Any access provided for these third parties to personal information is for the sole reason of performing formally agreed business tasks assigned to them on our behalf. They are obligated not to disclose or use the information for any other purpose than that formally agreed with us. At any time, the customer is enabled to request an export of all his/her processed personal information, to request to update his/her personal information and/or to erase permanently his/her personal information. Besides, at any time the customer is enabled to request a justification about the processing of his/her data. For all request regarding the managing of personal data, please take contact with our privacy department at GDPR@dFakto.com our data protection officers will be glad to provide you the requested information. For all further information regarding the data protection regulation applicable in Belgium and in Europe, please take contact with Belgian Privacy commission on their Website. Upon receipt of a request, regarding Data Subject Rights, dFakto will endeavour to complete the request within 30 days of the first business day on which the request was received and communicate within that period on the status of the request, including any necessary extensions up to a maximum of 3 months inclusive. Some icons and visual of the website were made from assets from the library freepik.